Wow, right? Ettika's new crop of beautiful, covetable bracelets and necklaces are so lovably loud, you can actually hear them if you lean in closely enough to your computer. Crafted from either silk cord or a chain that's familiar to any fans of Chanel's 2.55 bag, they may be the most colorful pieces of costume wonderfulness our eyes have ever seen – and with these eyes, that's saying a lot. 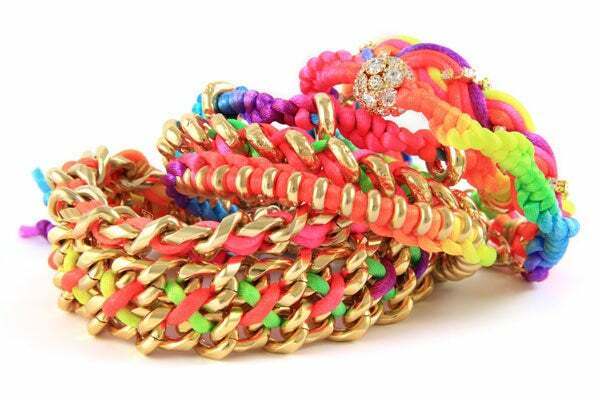 Starting around $60 a pop, these neon babies just beg to be stacked — and gifted as friendship bracelets. Personally, we want to see them paired with an all-white outfit – any takers?